As a user of a 15-inch Retina MacBook Pro, I’ve developed a habit of switching the screen resolution based on the task at hand—and how much effort my eyes feel like expending. The Displays pane in OS X’s System Preferences utility doesn’t offer many screen resolution choices—just five on the 15-inch Retina MacBook Pro, four on the 13-inch model, to be exact—and it doesn’t offer an easy way to access those resolutions on the fly. So I use a third-party utility. Fortunately, a number of resolution-switching utilities have debuted since Apple released its Retina-equipped laptops. The latest, Louder Than Ten's $5 Pupil gives you a systemwide menu; click it, and a list of available screen resolutions appears. Choose the resolution you want, and the screen changes. Simple. Once you customize your settings, changing resolutions is as easy as choosing one from Pupil's systemwide menu. On the 15-inch Retina MacBook Pro, Pupil provided me with access to 17 different screen resolutions, including 2880-by-1800 and 3840-by-2400. 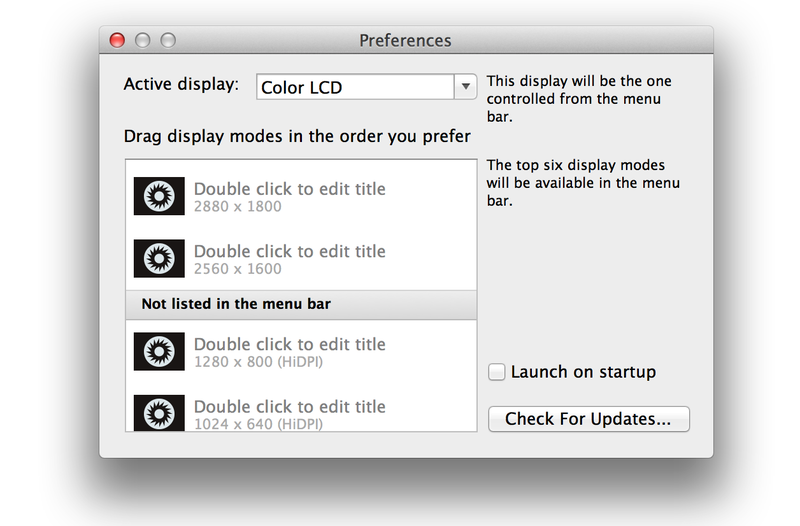 That’s a lot more than the five resolutions in OS X’s Displays pane, but far short of the 27 offered by QuickRes. More doesn’t necessarily mean better, though—chances are, the resolutions you need are in Pupil, and QuickRes offers resolutions you’ll likely never use. A representative for Pupil’s developer told me that the company decided to not show resolutions that don’t match the aspect ratio and color bit depth of the display. If you exceed five settings on your list, the icons don't necessarily match the settings. Pupil’s menu displays an icon next to each setting. This icon is intended to symbolically show the size of an example graphic—how it will appear on your screen at the corresponding resolution. However, there seem to be only five different icons, so if you’ve enabled more than five resolutions in the menu, the icons repeat themselves. The result is icon/resolution pairs that don’t seem to match up. When I asked the developer about this, the representative said that the company would look into the issue. Numbers intimidates some people, so Pupil lets you rename each setting. Instead of “1400 x 900 (HiDPI)”, you can rename that setting to “Reading,” or you can rename “3840 x 2400” to “Eye Strain.” Giving the settings names makes them much easier to find in Pupil’s list—and helps you choose the right setting for a particular task. You can give each enabled resolution a more-descriptive label. 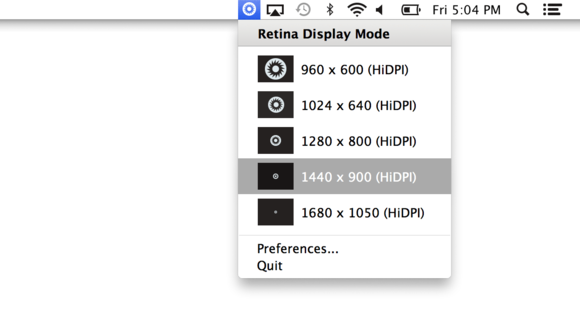 Another limitation—if you frequently connect an external display to your MacBook Pro—is that Pupil is optimized for a single display. On multiple-display setups, you must choose which display Pupil should control, and if you later want to change the resolution of the other display, you must first take a trip back to Pupil’s preferences and tell it to control that display. Finally, Pupil doesn’t provide any keyboard shortcuts—a deal killer for some users. Louder Than Ten and Padraig Kennedy, who collaborated on Pupil, put some thought into the design of the app. It’s convenient and pleasing to use, despite a few minor quirks. 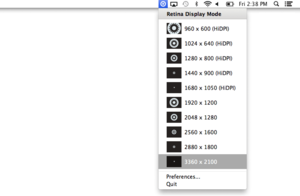 Retina MacBook Pro owners should have a screen resolution switching utility, and Pupil is one to consider. A 14-day demo of Pupil is available if you want to try before paying $5. 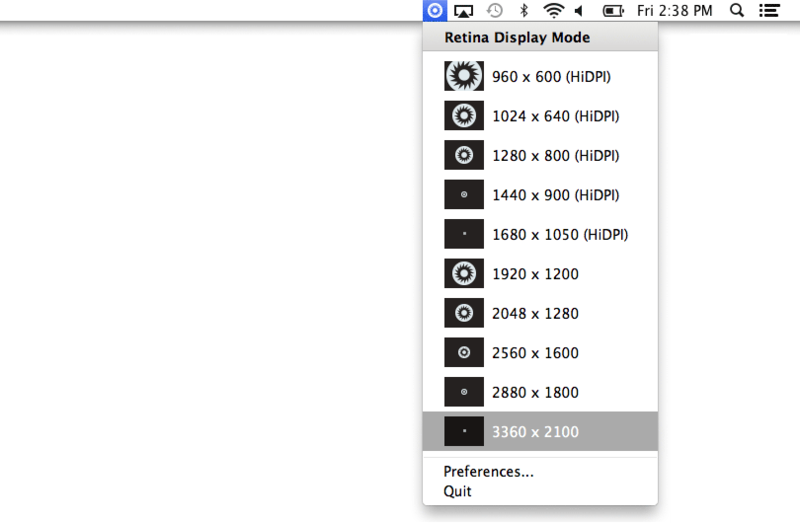 Retina MacBook Pro owners should have a screen resolution switching utility, and Pupil is one to consider. It’s convenient and pleasing to use, despite a few minor quirks.